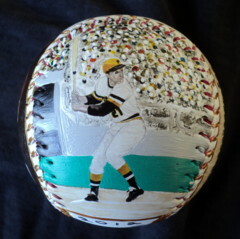 This Legends Hand Painted Hall Of Fame Baseball features three of my original paintings of Roberto Clemente. 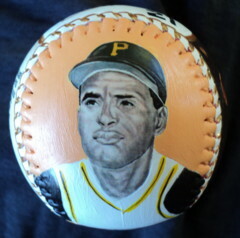 Side one is my close up painting of Roberto Clemente. Click here for a closer look. 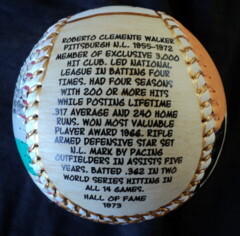 Side two has my action painting of Roberto getting his 3,000th hit on September 30, 1972. Click here for a closer look. 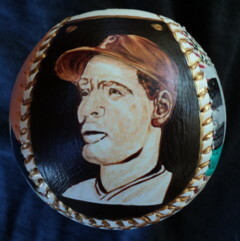 Side three has my painting of Roberto Clemente's golden Hall Of Fame plaque trimmed with gold. Click here for a closer look. 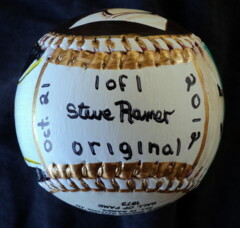 Side four shows exactly what is written on Clemente's Hall Of Fame plaque along with the year he was inducted into the Hall Of Fame. Also trimmed in gold. 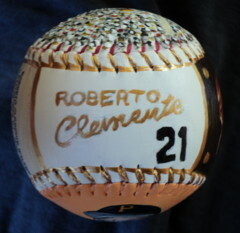 Side five, which is the top of the baseball, has "Roberto Clemente" hand painted in gold along with his famous number 21. Shipping is FREE within the Continental United States. Please add $15.50 for International Shipping when ordering (Includes Hawaii, Alaska, Canada and Puerto Rico).